For a while now I have been toying with the notion of creating a creative space, where us grown ups can do art, mess around and enjoy the same stress-free creativity the kids have been enjoying for so long. An evening where there are no expectations, but a few hours where you can wind down, engage your creative side, and let your analytical side take a vacation. It's much needed. I play groovy music in my art classes, it's a relaxed atmosphere and I have limited space. All classes are on Thursdays from 7-9 pm and BYOB. Sign up here before it's sold out and let's make art! CLICK ON A CLASS BELOW FOR MORE INFO! Changing campy thrift store paintings with typography a-la-WAYNE WHITE style with your own catch phrase from your favorite TV show, movie or that quintessential saying you have always wanted to PAINT FOR ALL THE WORLD TO SEE. Alternatively, you can paint a yeti emerging from the woods, or a Star Wars storm trooper crushing over the land or alter the picture with anything that floats your boat. The idea is to have some fun whilest sipping on a beverage and join in the non-stop talking. I provide everything except BYOB. One of the most versatile and enjoyable art forms from novices to experts is papier mâché. I think I like to repeat the words papier mâché often, because I figured out first, how to spell it, and second, how to use my computer to make the ˆ (the accent circonflex) and ´ (the accent aigu). Plus, third, sounding all French like that is super fancy. But, back to papier mâché, in this class we are going to make GINORMOUS initials. 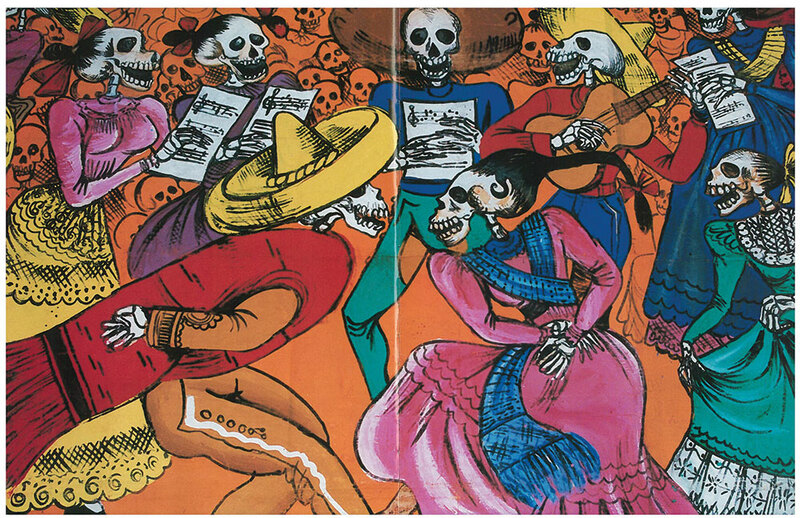 Día de los Muertos or Day of the Dead is my one of my favorite holidays, celebrated throughout Mexico, in particular the Central and South regions, a celebration developed from ancient traditions among its pre-Columbian cultures, dating back perhaps as long as 2,500–3,000 years ago. All over Mexico people celebrate the occasion with variables from state to state. Some areas focus heavily on food, others often have their own special parades to the beautifully decorated graveyards, others make many trinkets and sugary ornaments for altar decoration and always heavily influenced by marigolds everywhere. Whatever it is that they do, they love to embrace tradition and religion, and what shines for me is the love and honor they bestow on their deceased loved ones. One of these traditions in altar building, is making memory boxes, or also called shadow boxes. This class is all about the MEMORY BOX. You will start off with a provided cigar box, and can decorate and paint it as you please. I will provide all boxes, glue, paint, glitter as well as many wonderful little thingies, shiny stuff, eeny teeny tiny little calaveras and other fun colorful and sparkly things, and what I ask you to bring to make this one special and from the heart, is a few objects that would allow you to personalize your memory box. Things like a photo, or a pair of earrings, maybe some old coins or a ticket stub. You will know what. Here is a photo of a memory box I made for my cat Lenny who lived a short but fierce life and who was the anchor of the entire neighborhood. He was "El General". Dogs feared him and people walked circles around him, he's infamy was spread far and wide. Holiday season is coming and now is the time to make your super fab cards or simply gorgeous wall hangings. I love love love gelli printing or GELATIN printing. This weird rubbery flat jello like surface makes the most gorgeous outlandish professional prints. In making these you'll use paint, ink, leaves, a variety of paper shapes, you can even customize your shapes, (I have used mule heads in the past), and other interesting flat things like paper doilies, and voilà! (Ah, here we go with the French again. This time it is the accent grave. Fancy, fancy, fancy.) But for real, gelatin printing is one of the most satisfying and surprising art forms you can lay your hands on, bar none. Ever seen those beautiful twirly whirly colorful scarfs and paper folks wear and write on? Here's your chance to come and play with paint, ink, water, paper and cloth. It's fun, it's messy and it's beautiful. This class is $35 because silk, ahem. Inspired by Lynda Barry's wonderful journaling techniques, I delved into journal making and have yet to find or buy any journal that can come close to the wonderful piece of art I made all from scratch. This class will help you create your journal, and although it will take months (maybe weeks if you are a super achiever or years, if you're a slow poke like me) to fill, this handmade book, one page at a time. It's a class for beginners and experienced art folks alike, it's all a matter of how much you want to do. Having grown up in South Africa, this is a trait I noticed with a few of my fellow South Africans, where we create what we think is how it came to be. Explanation - my friend Nici, who's a nightingale and incredible troubadour, who writes mournful songs of love lost and odes to dogs was a huge Joni Mitchell fan. Growing up without television and at that time, the internet, the only way she could learn the songs was by listening to the records over and over and then copying them. Little did she know that Joni had a whole band, but Nici thought that Joni played all the parts, so she had to learn ALL the stringed sections...thus she played the rhythm and bass at the same time by moving her thumb across the top of the neck, and for someone tiny, she's about 5 ft tall, so you can imagine how small her hands are, this was quite a feat on more than one level. But that's how you roll when you are from South Africa. These necklaces are an ode to kooky inventions and living oulandishly. Come on down and let loose with lots of fun stuff, like bells and medals and chains and wire and beads and yarn and pieces of melted metal and what have you and create your own melody here.